Dating apps came onto the scene in the early 2000s, with ProxiDating launching in 2003. The service used Bluetooth to alert users when a compatible match was within 50 feet. Not long after came Badoo, Skout, Grindr, Tinder, and Bumble as well as app versions of existing dating sites like Match, eHarmony, Zoosk, and OkCupid. Today, it seems as if a new app comes out every day, and all kinds of new features for matching and chatting are launched. So we wanted to get into the minds of dating app users and take you through some of the most common things they do. According to research conducted by Ogury.com, a mobile data company, men are twice as active as women on dating apps. This statistic consists of more than 6 million singles surveyed in New York City (84.8% men vs. 15.2% women), London (81% vs. 19%), Rome (76.5% vs. 23.5%), Paris (75.6% vs. 24.4%), and Madrid (67.5% vs. 32.5%). Some reasons men are more active than women on dating apps could be that women tend to get a lot more messages than men, so men often have to do more of the initiating. That same Ogury study found that women in Madrid are the most active on dating apps, followed by women in Rome, Paris, London, and, lastly, New York City. You’ll notice that engagement is the lowest in English-speaking cities. Perhaps the culture has something to do with it. Founded in 2012, Tinder revolutionized the mobile dating space by creating the swiping matching system. Today, about 50 million people use the app every month, and it’s available in over 40 languages. 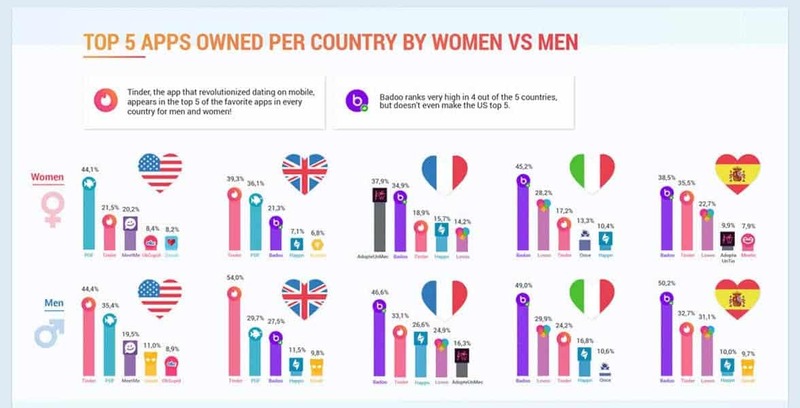 So it’s really no surprise that Tinder was among the top five most popular dating apps in every country polled (the US, the UK, France, Italy, and Spain) in the Ogury study. Ogury’s infographic also shows that dating app users are most active on Thursdays compared with every other day of the week. 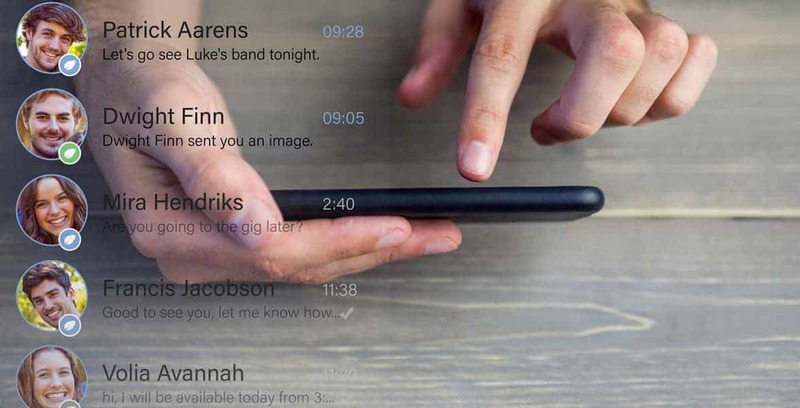 On average, men and women spend 27 minutes and 32 seconds swiping and messaging. We imagine that they’re preparing for the upcoming weekend. While Thursdays see a lot of dating app engagement overall, the most active day for users appears to be different for Grindr members in the US and the UK, who both prefer Sunday. Specifically, around 11:55 p.m. might be the best time for gay, bisexual, and curious singles to log in. Ogury looked into gender ratios as well, and the research shows that male dating app users greatly outnumber female dating app users in California — even though the state has the largest volume of dating app users in the country. 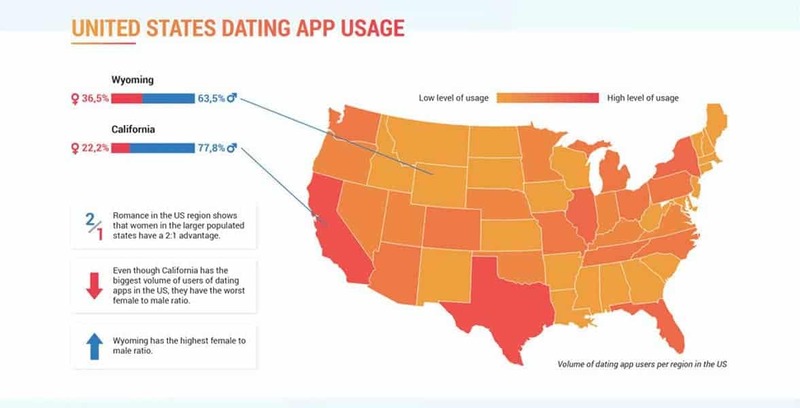 Ogury also analyzed which states had the most active dating app users, and California, Texas, and New York are among the most, and Wyoming, Idaho, and South Dakota are among the least. In fact, for every 2 women using a dating app, there are 8 men also using a dating app in that state. Ladies, you might want to book that flight now. On the flip side, Wyoming has among the lowest dating app user volume, but the state has the highest — about a 1 to 2 — female-to-male ratio (36.5% to 63.5%, respectively). In general, female dating app users who live in the most populated states outnumber the men by 2 to 1. California seems to be the exception, though. As a whole, the US population is almost evenly split between men and women (51% women compared with 49% men). Interestingly enough, the survey found that people uninstalled a dating app on the same day they downloaded it, which shows that first impressions really matter. 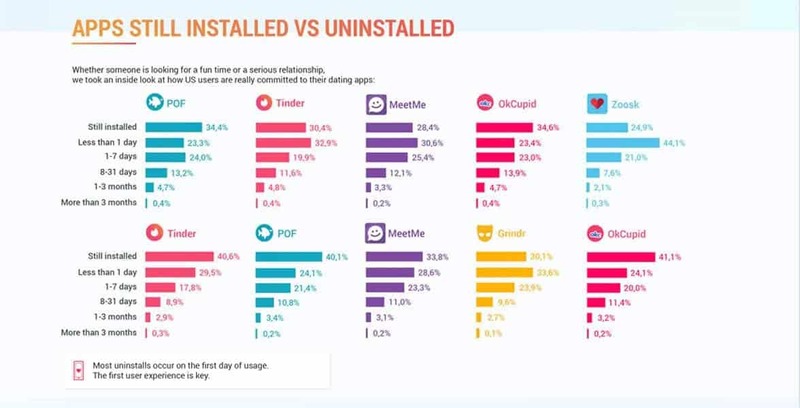 First impressions are very important on dating apps, and most users seem to be unimpressed, as they tend to uninstall an app the same day as downloading it. It looks like OkCupid has a great first-time user experience because it has the highest percentage of users who haven’t uninstalled the app. It is followed by Tinder, Plenty of Fish, and MeetMe. Bustle and Happn, another popular dating app, got together to learn more about the habits of dating app users as well and discovered some really interesting things. One statistic showed that about 4 out of 10 men and women want to set up the first date rather quickly after that first message on a dating app. They don’t want to talk for weeks on end — they want to get on the date to see if the chemistry is there in person. The Bustle and Happn study also found that a majority of women and more than half of men are using a dating app to find a long-term commitment. Sometimes there’s a misconception that dating apps are only for hooking up, and while that is happening, it’s not as prevalent as some people may think. Mobile dating is all about giving people options, so it’s no surprise that a lot of mobile daters communicate with more than one match at a time. About half of dating app users talk to two to three matches at one time, while only 10% of men and 14% of women talk to four to five matches at one time. Singles have some intriguing photo preferences, too. Bustle and Happn report that 51% of men (vs. 24% of women) are more likely to respond to a profile picture if it’s a full-length body shot. Many psychologists, biologists, and other experts have said men tend to be more visual, and this just may be another stat that’s proving that fact. So what type of photos attract women the most? Perhaps unsurprisingly, not the same as men. Approximately, 60% of women said they are more likely to respond to a profile picture that’s a face shot, in the words of Bustle and Happn. That’s compared to 35% of men who respond to the same type of photo. Some research has found that women are less visual than men. More scientifically, their amygdalas show lower levels of activity than men’s amygdalas when viewing sexually visual stimuli. We round out our list with the fact that, even when using a dating app, a majority of men and women don’t limit themselves to the platform — they still try to meet people in real life as well. Favorite ways include meeting people at parties, bars, while volunteering or attending a class, and activities like that. Why not try to increase your odds, you know? We’ve taken you through 17 of the most surprising habits of dating app users, but there are plenty more. Some habits may be worth changing, but most of them are simply insightful. These statistics show us where mobile dating has been, where it is now, and where it could be heading. Now you know!